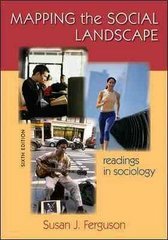 Mapping the Social Landscape: Readings in Sociology 6 Edition Drawing from a wide selection of classic and contemporary works, the 58 selections in this best-selling reader represent a plurality of voices and views within sociology. In addition to classic works by authors such as Karl Marx, Max Weber, C. Wright Mills, David Rosenhan, Kingsley Davis and Wilbert Moore, this anthology presents a wide range of contemporary scholarship, some of which provides new treatments of traditional concepts. By integrating issues of diversity throughout the book, Ferguson helps students see the inter-relationships of race, social class, and gender, and the ways in which they have shaped the experiences of all people in society.